3 Legged Thing has introduced two new monopods with a rugged foot stabilizer for both video and still photography. 3 Legged Thing introduced its Alan and Trent models of monopods along with Docz, its rugged foot stabilizer. All are designed for heavy camera loads. Alan is a professional carbon fiber monopod. Designed for ultimate stability and rigidity, Alan weighs just over 1.34 pounds, yet he can support up to 132 pounds — about 100 times its own weight. It ranges in length from 17.7 to 58.7 inches. Trent is one of the tallest monopods in the world today. Made from aircraft grade magnesium alloy, it can support up to 66 pounds of camera gear and is also rigid enough to be used as a camera or microphone boom. Trent ranges from 24 to 80 inches in length. 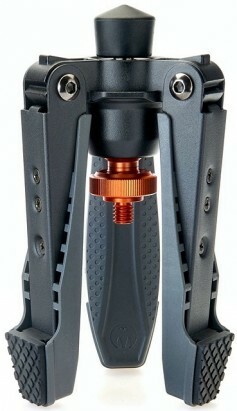 Docz is the foot stabilizer designed to add extra stability to the monopods. Built from rugged alloys, it features an adjustable ball which can aid smooth movement for video sports or action shots. It can support 44 pounds. All three products will be available from August 1.